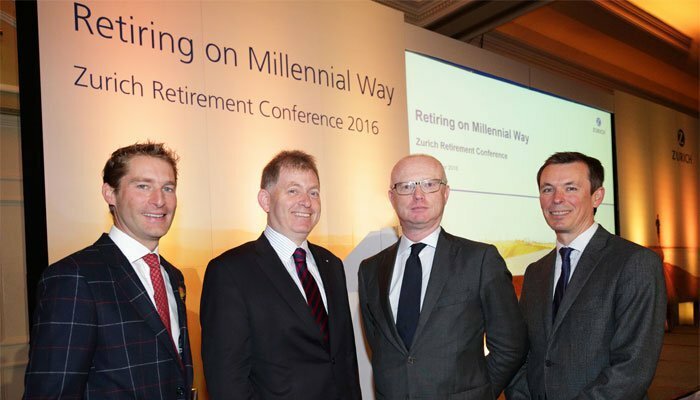 Ken Hughes was animated when he spoke at the 2016 Zurich Retirement Conference in Dublin. Niamh Mac Sweeney talked to the consumer specialist to get a deeper understanding of millennials' behaviour and their interaction with brands. (L-r) Ken Hughes, Shopper and Consumer Behaviouralist; Anthony Brennan, CEO, Zurich Ireland; Dan O'Brien, Economist; Ronan O'Neill, Head of Broker Marketing, Zurich Life. "No pain just gain", should be your customer experience mantra according to Ken Hughes. "Many companies spend a lot of time plotting their customer journey in great detail, but then they fail to 'feel' along it for the pain points," he says. According to the consumer and shopper behaviouralist, these pain points are where it can all go wrong for a brand, especially if they fail to recognise what their customer is likely to share with their peers via social media, and what their overarching memory of the experience will be. But there is good news. "Just as in life, pain is just a symptom of the problem. Isolate the pain and fix it and your brand will live longer," Hughes says. Millennials are a generation of sharers. They have high expectations when it comes to what they expect from life, relationships and brands. They also have a clear idea of how they want to consume goods and services and the type of purchasing experience they expect. These digital natives demand a personalised experience when interacting with brands. They expect all transactions to be seamless and efficient at every touch point. Therefore, businesses need to adapt and prepare to meet these needs and ensure that they provide the consumer with a personal and frictionless service. With regard to investing in the future, the millennial generation are slow to start a pension. Why is that and what can be done to engage better with this demographic? "For me it's about relevance," Hughes says. "The pension product might not be relevant to the millennial right now. The main problem is the long-term projection. The millennial isn't interested in money that will be there for them in 40 years, they want access to it now." In addition to consumer behaviour, there are other cultural shifts at play too. Millennials are unlikely to stay in the one job for very long. Hughes explains: "My father stayed in one job his whole career, I will have a few jobs throughout my career, but our children will probably have many careers throughout their working lives." Hughes believes that because of this their income levies will change a number of times throughout their working lives so the idea of putting a certain amount into a pension plan might not work for them. "They don't have this linear thinking so the model the products are based around needs to change," he says. Hughes also argues that the way pension products are sold needs to be ratified. "If we are selling an anti-aging cream we would tell the consumer they will look beautiful after using it. The same principle applies to selling pension products. Consumers need to be shown the life they could have if they have a pension. We need to have a bigger carrot and show them here's the life you could have if you save a certain amount." Applying a personalisation strategy to pensions is a step in the right direction. We are all aware of the pension gap and the need to save for retirement, yet somehow this message is getting lost. Adapting a new approach is required if pension providers are to engage and captivate millennials. A business relationship between a consumer and a brand is no different to a personal relationship, which is based on experiences. According to Hughes, the best way to build tribal sense of belonging, loyalty and engagement is through emotional experiences. "Pension providers should be asking their customers: where are you now, how do you want to work in the future and what kind of job do you dream of doing? Then you can start to create and personalise a pension model around their lifestyle choices or dreams." The millennials are a generation that have been raised on everything being instant and centred around them. In order to meet their demands, brands need to look closely at the customer journey. "Put on a white coat and stethoscope and start poking. Find the pain points. Acknowledge and then do everything in your power to dissolve them," Hughes concludes.